I like the names there! I've got to say, I like this one. I think that the big bay doors in the roof for cargo holds is an underused thing, and yet would make perfect sense in a world with cheap anti-grav for lifting stuff: just go overhead and lower it in, job done. 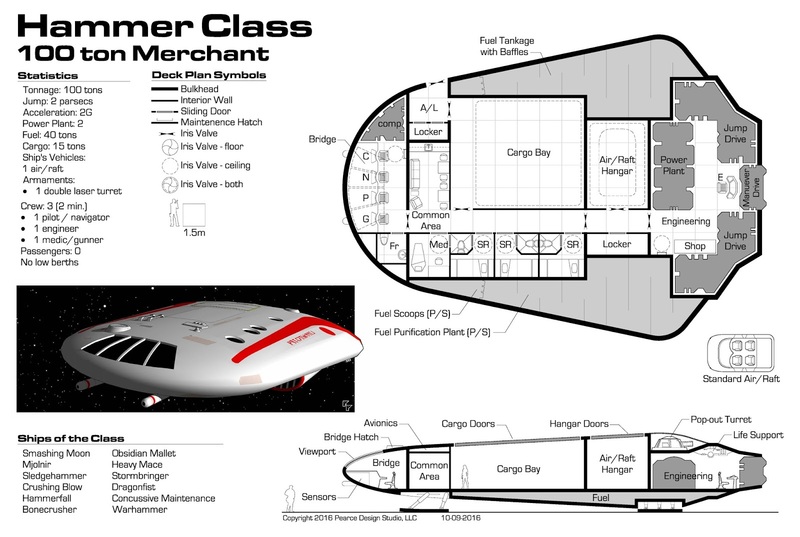 I think a larger version of this ship - similar design, but 200 tons - would be really good, if you ever have the time. Thanks, John. I plan to do a lot more with this ship, unfortunately real life has put a serious damper on my Traveller hobby lately. Someday though! SO.. I just had another thought. The Hammer is a great little ship. Versatile etc. Now... How would a company 'Stretch' a Hammer's legs? Save about 4 to 6 ton. Up the quality of the flight controls to off set the penalties. Use said mass savings to add in 'Drop tank' couplings. Now said ship can have her tanks full 'Plus' more jump fuel. Ship charges the J-2 feild, blows the tanks and slips into Jump space. Comes out of jump a week later still with enough fuel for another J-2. Not a quick way of covering a J-4 route.... But do-able.